When you first looked at a world map in grade school, you surely noticed a weird similarity between the shapes of South America and Africa. As soon as the first accurate world maps were made people noticed this very same similarity. They fit almost perfectly together. The unbelievable fit lead people to wonder how this could possibly be. The best hypothesis explaining these similarities is called CONTINENTAL DRIFT. THE CONTINENTAL DRIFT THEORY SUGGESTS THAT THE CONTINENTS ARE NOT STATIONARY AT ALL, BUT ACTUALLY MOVE OVER TIME. Scientists now know that the Earth’s surface consists of a number of rigid, but moving, pieces called plates. In some areas the plates are moving away from each other, in other areas they are moving closer together. PLATE TECTONICS IS THE STUDY OF THE FORMATION AND MOVEMENT OF THESE PLATES. In this unit we will learn not only how and why these plates move, but what the results of those movements are. 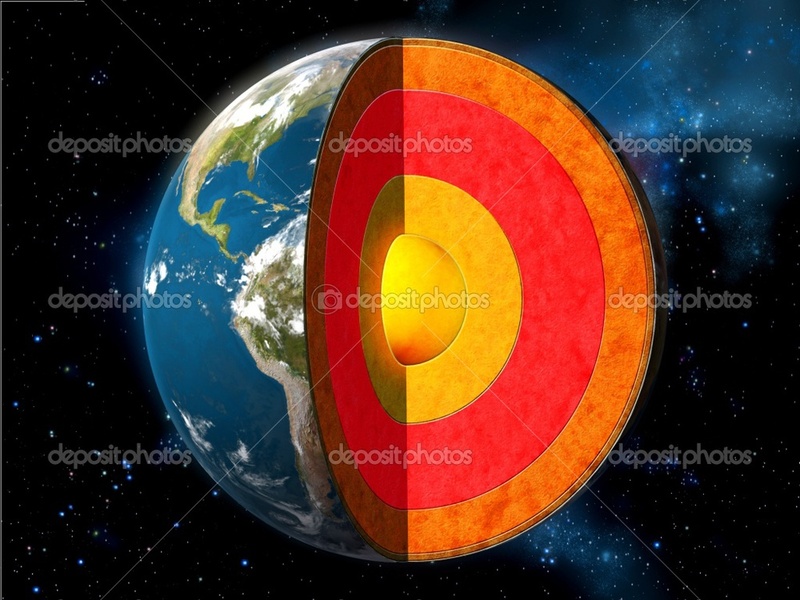 Through the study of seismic waves, we now know that the Earth's interior is split into different layers. Each layer has its own unique properties, with different temperatures, pressures, densities, and composition. THE LITHOSPHERE IS THE OUTERMOST PART OF THE EARTH. Its mostly made of solid rock, but includes soil and sediment deposits. The crust is broken into different plates all of which are either continental or oceanic. THE ASTHENOSPHERE IS THE UPPER PART OF THE MANTLE. IT IS MADE OF PARTIALLY MELTED ROCK THAT FLOWS VERY SLOWLY. THE FLOW IN THE ASTHENOSPHERE IS CAUSED BY CONVECTION CURRENTS, AND THESE CURRENTS CAUSE ALL TECTONIC MOVEMENT. Convection currents are driven by differences in temperature. As material HEATS it expands and RISES as a result. As it rises it begins to COOLS and contract and SINKS as a result. Within the asthenosphere convection currents cause parts of the mantle to rise up underneath the crust pushing old material aside. This makes plates move apart. Where cooler material sinks, plates are pulled together. THE STIFFER MANTLE IS MOSTLY SOLID, THICK LAYER OF THE EARTH. It mostly solid, and it is the thickest of earths layers, making up about 80% of Earth’s volume. As depth within the Stiffer Mantle increases, the density of the rocks begins to increase starting at about 3.3g/cm3 and going up to 5.5g/cm3. Underneath the mantle is the Earth’s core. THE CORE IS DIVIDED INTO TWO SECTIONS, THE OUTER CORE AND INNER CORE. BOTH PARTS OF THE CORE ARE MADE OF MOSTLY IRON AND NICKEL. THE OUTER CORE IS LIQUID. It is made from melted iron and nickel, with a density of 9.9 – 12.1 g/cm3. THE INNER CORE IS SOLID. The great pressure at this depth, it is made of the same things, but it is more dense ranging from 12.7 – 13 g/cm3. As always, the good ole ESRT has a great deal of information to help us out with Regents questions about the Earth's interior. If we turn to page 8 we can see the Properties of the Earth's Interior. There is a great deal of info on this page so lets break it down piece by piece. The top part of the page shows a cross-section of the Earth with each layer labeled. To the right there is more information about each layer such as its density. 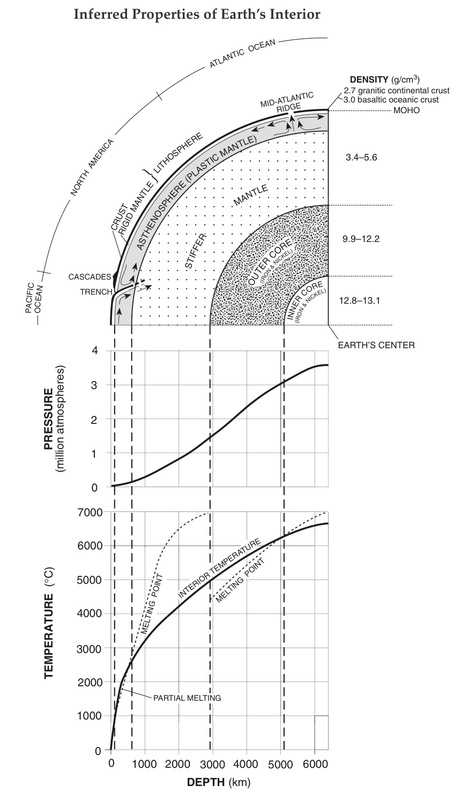 The next 2 sections show us the relationship between depth, pressure, and temperature. It works exactly the same as every other chart we have seen so far. Let's Practice: What is the temperature of the Earth at a depth of 4,000 km? Start by going to a depth of 4,000 on the X-axis. Move up until you hit the curve. Look to the left to find the Temperature. Let's Practice: What is the pressure of the Earth at a depth of 4,000 km? Move up until you hit the curve on the pressure graph. Look to the left to find the pressure. Let's Practice: What layer of the Earth is at a depth of 4,000 km? Move straight up to the Earth cross section.